"Traditional authority perpetuates orisa economics. 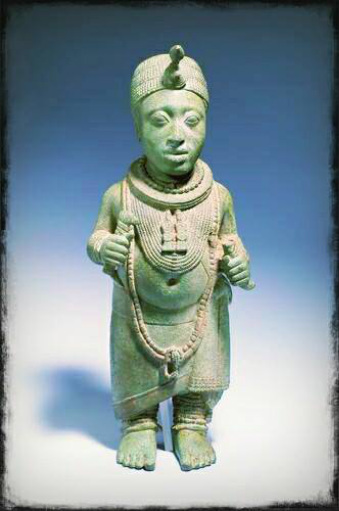 The king has always been been the greatest patron of Yoruba arts, including sculpting, wood carving, bronze casting, weaving, drumming and dance. The best architects, builders, and city planners would gravitate to the palace, where they would be commissioned by the numerous chiefs, queens and princes. When you consider that, in the great kingdom of Ile Ife, there is an orisa festival everyday except one, you can easily see the ways in which art, worship and governance intersect and drive the orisa economy. A vibrant market, where artists, priests, builders and farmers thrive signifies a successful kingdom. And so it is for you: As you ascend the throne of your personal destiny, it is equally important to perpetuate the economic structure that supports orisa lifestyle. Where are the agriculturalists, the carvers and potters who produce the materials essential to your devotion? What happens in the shrine is just one thread of orisa devotion. In reality, orisa lifestyle is a closed looped system, wherein everything you eat, wear and make use of is meant to reinforce use traditional social structure and the spiritual values it generates. This is what it means to live the medicine. Learn more: www.agbole.weebly.com"